Part two of the new era in adidas history comes in the form of ACE15.1. 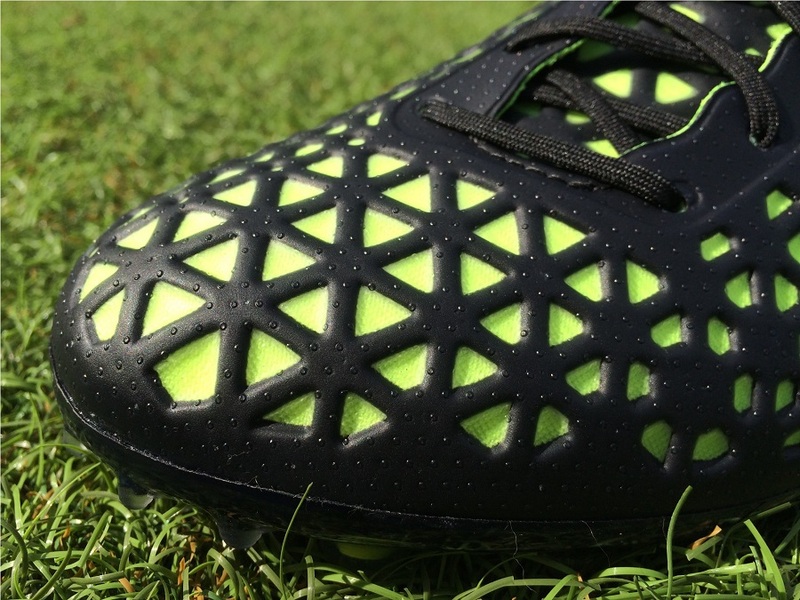 This is a boot focused toward a staple player on the market, except in a completely new way. The “Playmaker” is that player, the one who likes to control the game and make things happen. What sets this boot apart is its larger than life silhouette and design, with more skin and bones than one might expect from an expectantly stealth performing boot. There is a lot to take on with this one, although most might be a little more positive than you expect! Over the past we weeks we have been testing them and here is a breakdown of what you can expect from a pair. If you want a pair of ACE15.1 find the entire current line-up at soccer.com. Who really expected adidas to retire their entire selection of boots in favor of two completely new silos? Not many people took them seriously when rumors surfaced a year ago – but the German brand went ahead and completely shocked the boot world. As a result expectations for the new boots are incredibly high, and the boots HAVE to deliver from a performance perspective if fans are to take adidas serious going forward. Right from the beginning, these boots take charge and immediately put in the work to become your best friend. The fit right around the foot feels phenomenal and coupled with everything the super flexible soleplate has to offer, they leave you with wonderful positive emotions through the first few wears. That never ends, and only improves as the shape begins to adjust and mold to your specific foot shape. I basically took these boots right out of the box for the first time and into training with no problems, and I seriously doubt there will be any players with complaints after wearing them. Around the ankle and heel they are adequately padded and there is plenty of protection through the forefoot. Inside the boot, they are very soft with no evident seems – so you could technically wear them with no socks if needed. Right through wear the positives kept in check and these were a dream to wear. So much so, that I’d rate these as one of the most comfortable boots out there at the moment. When you combine all aspects and elements of the release (per the review below) them come together exceptionally well and deliver. Comfort wise, these are a winner! What is with the Upper Design? It is no surprise that most questions about the boot focus on the unique black web style design that sits across the forefoot of the boot, it is what gives the boot some added attitude. The first thing to note is that the name attributed with the upper is “TotalSkin”. 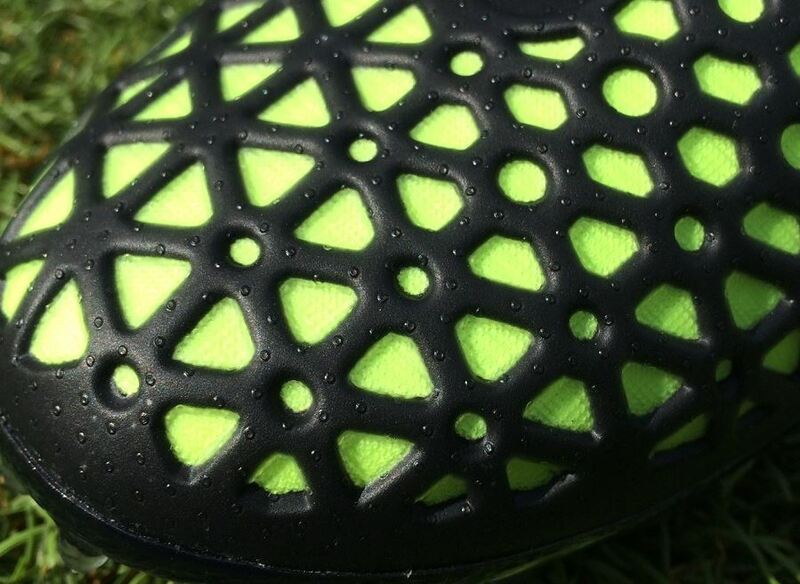 This is a 3-layer synthetic compound combined with a grippy EVA to provide players with an unbeatable first touch. The black overlay is actually called that 3D Control Web system, and again it serves the purpose of aiding ball handling by allowing for more friction between ball and foot. Contrary to what you might think, it is very flexible and easily moves in motion with your foot. It is split into two halves, with slightly different patterns on both sides. On the lateral side, the panels form a pretty even honeycomb design, while on the instep they feature a more intricate pattern with additional cuts. By making the design a little more broken up, if you will, it provides an additional level of flexibility through what we would call the the “control zone” or the strikezone through toe. This is ideal for a more natural feel on the ball, especially as you dribble or look to play through balls. On the other side of the spectrum, the lateral side is slightly more rigid, ever so slightly, making them perfect for outside the foot passes where you need a little extra spring through striking. The upper is also treated to a coating of “NSG”, which is the dimple feel you get if you rub your hand across the upper. This provide a top quality touch regardless of weather conditions, or basically a little extra grip. With the release came an immediate connection to playmakers and players that like to control the game. It players a label on the boot that goes against what most would expect them to be. This kind of player is an intelligent player who has a vision about what the team needs. He controls. Given the construction of the upper, that suits the style one might need in the position. But what about when it comes to shooting and crossing the ball? Well, they perform just as well and that has a lot to do with the compound across the forefoot. It acts like elements of the Predator series did before them, giving a little extra grip and rebound as you strike the ball solid. I found shooting to be particularly efficient and loved the connected feel with the ball. So, even though they carry that “playmaker” element, they are also certainly useful for more direct attacking players. For me, this is where the boots get interesting. Right from the first time I help them in hand, it piqued my intrigue due to its extremely emphatic style. 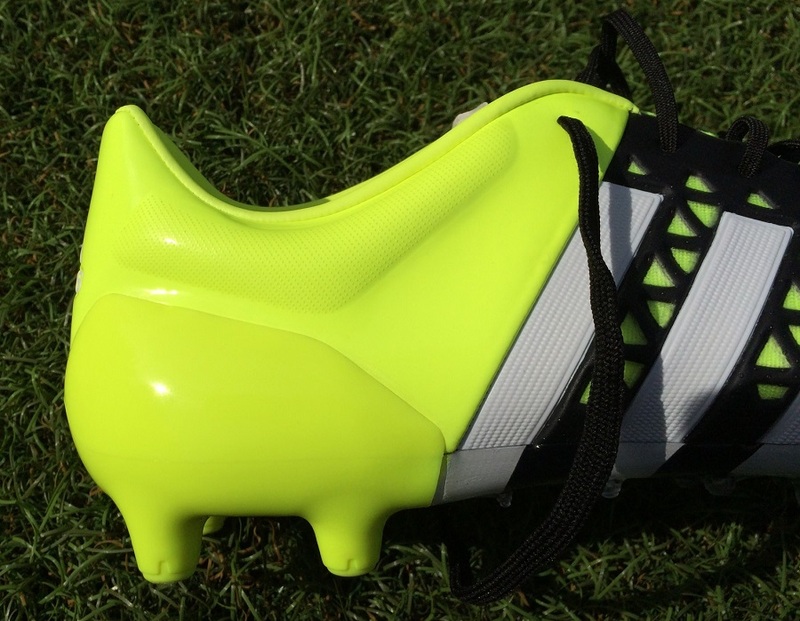 Like the X15, adidas has labelled this boot as AG/FG compatible. In other words, they are intended for wear on both natural and artificial surfaces. The concept of advertising them this way is extremely smart and the first time we have seen a big brand try pull it off. Pulling it off is key of course, otherwise you lose authority and this is a really no brand has pushed the term. So, what do you get? Right across the soleplate, adidas has added a multitude of different sized conical studs that make for one of the most well covered soleplates of all time. Just counting the primary studs (those in yellow) there are 18 across the forefoot! Then a combination of 15 sit smaller nubs sit through the midfoot and 10 line the front of the boot. In total, the makes 43 different pieces that jolt from the surface, plus of course there are 4 more on the heel. It is all about gaining adequate traction through the right moves. Going into testing, I did have some reservations on how it was going to function on different surfaces and if they would provide too much grip. With so much in play, you get a feeling that traction could be altered. But, I’ve got to admit that adidas has got it pretty spot on with the design. I’ve had the opportunity to wear them on natural grass and artificial turf with very positive results on both. I was more than surprised with how much traction you get, especially through turns and quick direction changes. It is one of those occasions when a new addition to a boot starts to work on my opinions, as I try to establish how it can actually work as well as it does with no sticky feeling on different surfaces! One of the conversations I had while at “The Base” Berlin a few weeks was with the lead designers of the Ace. My key question about the boot was if it was an upgraded version of the 11Pro series, a hybrid with some Predator elements in stalled through the forefoot. The Leather version, in particular, looks very similar to the final edition of the fabled comfort boot. Without batting an eyelid, the response came and it was concrete; right from the beginning, Adidas wanted to create a revolutionary new boot, and the 11Pro was never included in those conversations. The performance of this boot is intended to be totally different with a direct emphasis on players that like to control the game and create chances. 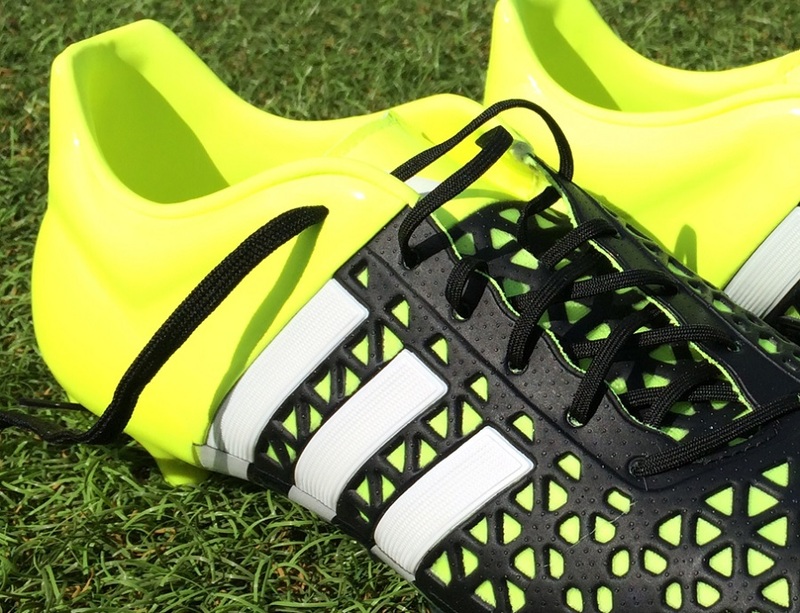 This version of the Ace15 is very accommodating and will suit most players in need of a generalized wide fit. Open up the laces and they offer ample space, it is then down to creating the custom fit you personally need. You might also expect there to be no stretch through wear because of the compound that sits across the upper – but that is not the case! There is a little give in these, so if you find them to be a little tight the first time you try them out, don’t be discouraged. Give them one or two wears to loosen up. Visually, these are not a striking boot and they seem very underwhelming when you compare them to other recent releases on the market. Yes they feature that unusual web style forefoot, but the overall appearance seems mundane. My only negative at this point is the fact so many fans have immediately downplayed the boot as a result. To be honest, I was one of those and I left these for testing second (behind the X15 review) as I wasn’t at all excited. It is in performance where these truly excel, and I doubt there will be too many complaints from players that take the opportunity to wear a pair! Highlight: Super comfortable boot that goes against player expectation and performs perfectly for any style of attacking player. Weight: A very balanced 9oz. Would I Buy Them: Yes – they have a lot of positives going. Before testing I’d have given you a maybe response, so that shows how well these played out during the review. Player Position: Even though adidas has gone with an attack minded marketing plan, the Ace 15 is about as multi-functional as you can get. 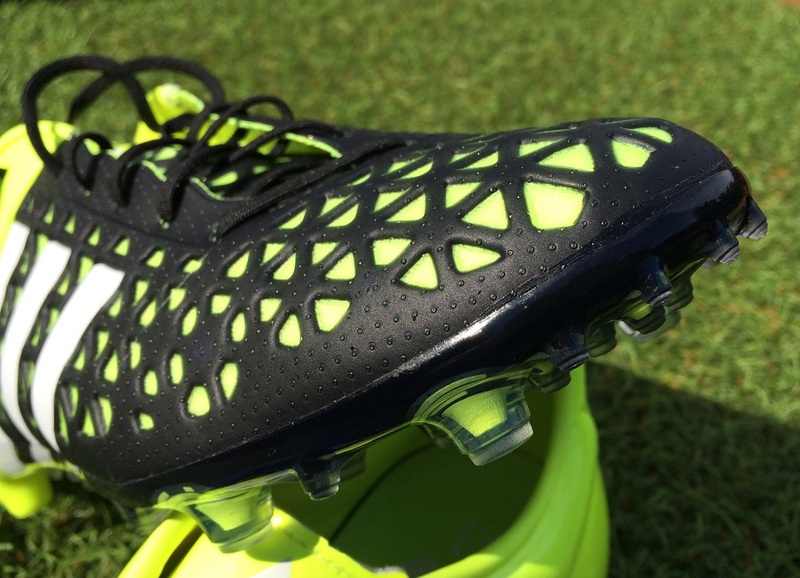 Pretty much every style of player can create in these boots without hampering performance. Therefore, Bryan, can I safely assume, without any reservations whatsoever, that the Ace 15.1 is a better boot than the X 15.1? I love the look of these!! Honestly some of the best looking boots I have ever seen. I made a pair on miAdidas and can’t wait for them to come. Great review. I love the idea of this boot, especially since the CTR360s are off the market. I will look at getting a pair on miAdidas to compensate of the blah initial design. So great to have an AG/FG boot! Great review Bryan!!! 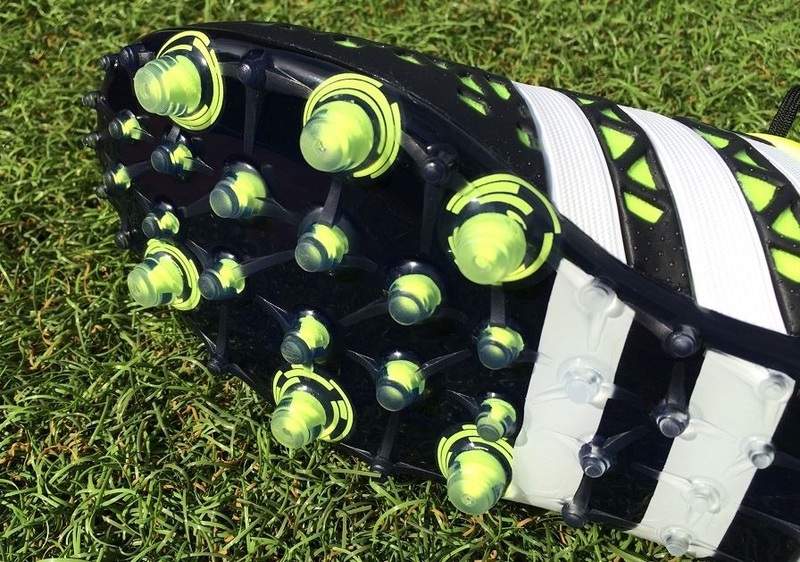 How would these compare to the good old T90 Laser IV in your opinion Bryan? I'm looking for a replacement for mine and since Nike discontinued the T90 silo the Ace 15.1 caught my attention from the beginning. I know they're intended for different playing (Power vs Control) but I would like to know if they're somewhat equivalent. 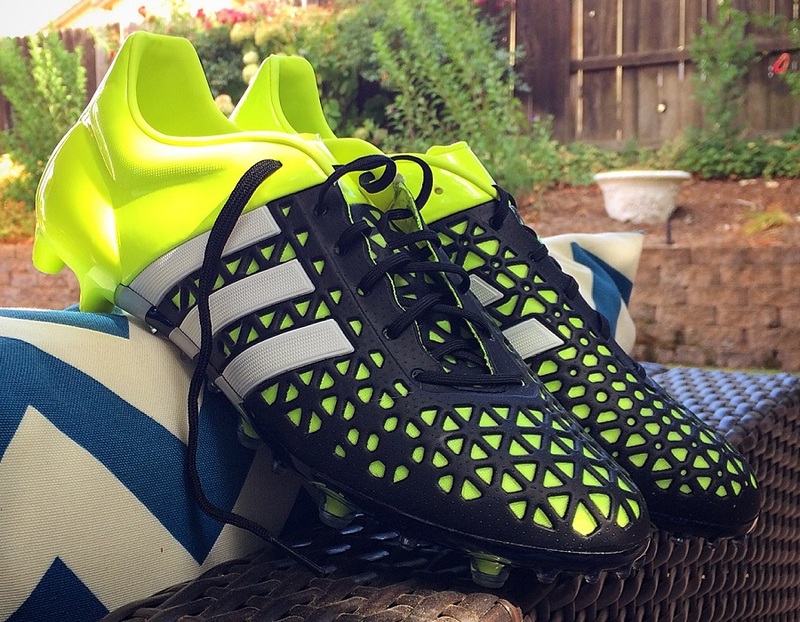 For whatever reason, the most recent Nitrocharge fit me better than any other shoe. Do you know how the fit on the Ace compares? How do these compare to the Nike Tiempo or Magista Obra control wise? Would you recommend the Ace 15.1 over than the aforementioned cleats? 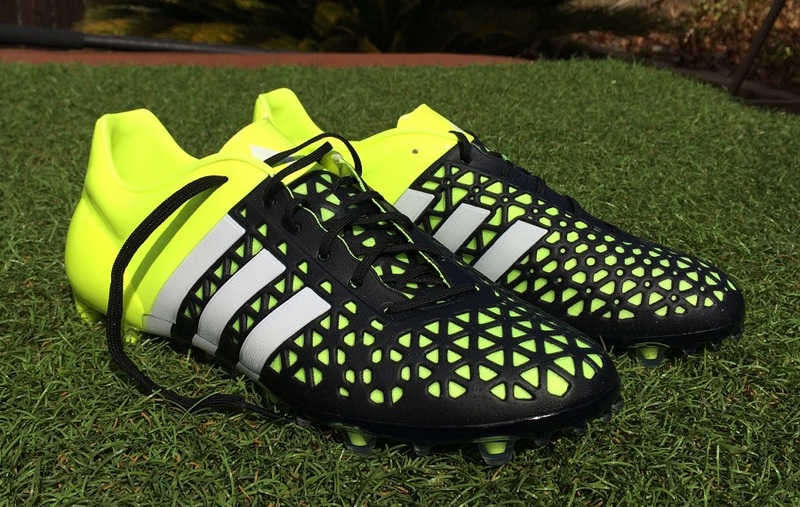 Also interested like the posters above if you'd take these Adidas Ace over a new pair of Nike Magista Obras? Length wise I have head it's best to drop down half a size to ensure best possible fit? Did you experience some addition room in the toes/heel slip by going true to size? Thanks and fantastic review as always!! Bryan: Is the hybrid soleplate for the Ace 15.1 being phased out? I see that the 16.1 doesn't have it. I'm guessing that I should jump on a pair of these before they are all gone? They are sticking with the same FG/AG multi-purpose functionality with these current boots, but yes the configuration is changed up! 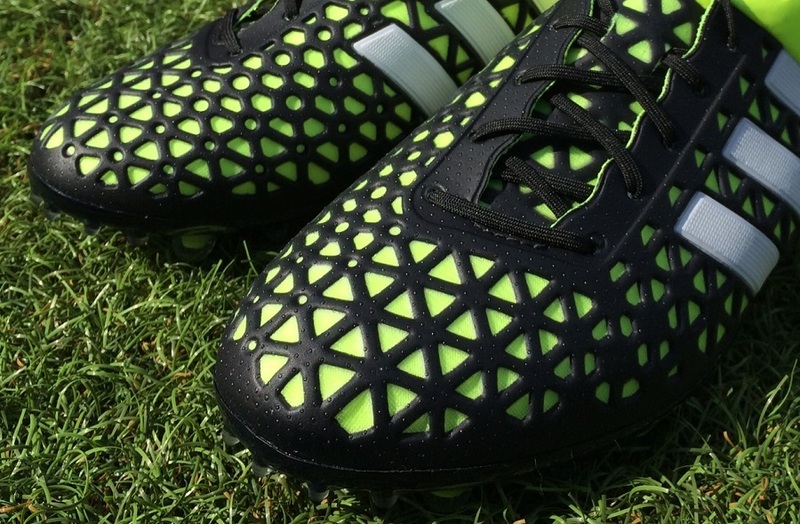 Are you gonna do a new review on the Ace 16.1 synthetic or the leather? just because the prime knit is a bit pricey and the 16.1 model is on sale already on soccer.com. I bought the ACE synthetic and leathers. Couldn't decide between the 2 and both beautiful products. Got to be honest, this already be Adidas' worst boot ever! Ace16 had made it even worse. I'm the long time Predator user, and it doesn't felt like the Predator's sucessor at all! :angry!